Conventional Windows wisdom seems to hold that every other version of Windows is terrible and needs to be fixed by whatever version comes after that. Does this mantra sound familiar? Windows XP, good. Windows Vista, bad. Windows 7, good. Windows 8, bad. Windows 9, good. That's how it's supposed to go, right? Given the drastic changes in Windows 8, it's no surprise that some users who hate it are already holding out hope for a better Windows 9. I'm here to deliver the bad news: Windows 9 won't provide salvation, at least not if you're hoping for Microsoft to alter its current trajectory. Unless you're willing to embrace the changes Microsoft is making in Windows 8, be prepared to stick with your current version of Windows for a long time. Although Windows 8 has a fair share of perks for the traditional desktop, the operating system's featured attraction is its new touchscreen interface. Instead of the pop-up Start menu that's been around since Windows 95, there's a full-screen Start page with a grid of big, touchable app tiles. Within this menu, you'll find the Windows Store, full of apps that seem to have tablets in mind. To take advantage of the software, Microsoft and PC makers plan to sell laptop-tablet hybrids, meant to offer the best of both worlds. If you have zero interest in tablets or touchscreens, these changes might seem upsetting. It's as if Windows, nerdy at heart, showed up to school with a hip new look, intent on abandoning its geeky friends. Yet, it has to be this way. PC sales are down, while iPad sales are surging. People are turning to the iPad when they just need to get online or play with some apps. Although PC purists insist that you can't do real work on an iPad, the body of evidence to the contrary keeps increasing. Office Suite apps abound, as do keyboard cases that make the iPad more laptop-like. You can write code and design webpages on the iPad. You can compose music and edit video, too. None of this means the PC is doomed, but, as a general-purpose, go-to computing solution, PCs face a serious threat from tablets, especially the iPad. Microsoft must respond with an OS that makes sense for tablets. You might argue that Microsoft should have left Windows alone while building a separate tablet OS on the side. But who would use the latter? Windows PC users would have little incentive to switch, which leaves Microsoft to figure out how to lure prospective iPad buyers. That's a tall order, and it certainly hasn't worked out for Android tablets, which aren't selling very well. Instead of going that route, Microsoft is using Windows 8 to force the transition for anyone who buys a new PC. As Technologizer's Harry McCracken pointed out a year ago, Microsoft's transition to Windows 8 is as radical a change as the company's move from DOS to Windows 3.0. Then, as now, Microsoft had to tread lightly, letting people fall back onto their old software and old ways of doing things. But, over time, the old way got phased out. Today's command prompt is but a distant relative of the DOS version, and most Windows users never go near it. Microsoft is banking on the chance that, as it redefines Windows, it can guide users through their own transitions. If you've used a PC your entire computing life, changing OSes means throwing away all the keyboard shortcuts you've learned, as well as losing all your USB accessories, the file system, and the eponymous windows. 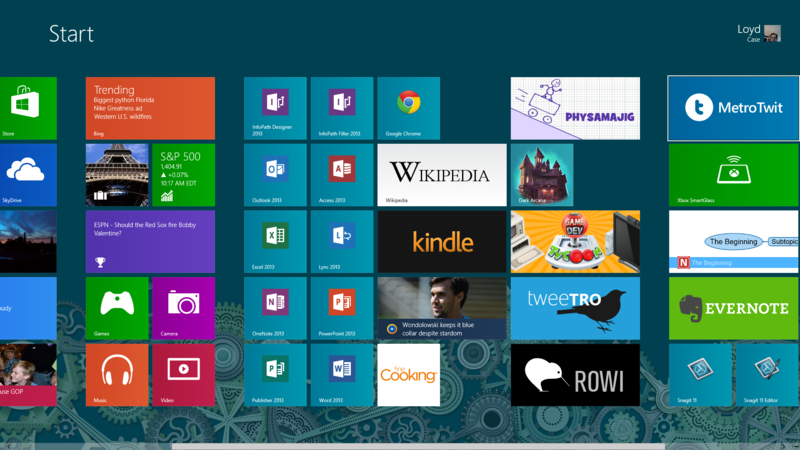 Windows 8 lets you keep all those things while it introduces something new. One possibility would be for Microsoft to concede defeat. Instead of forcing users to adopt the new Windows interface, Microsoft could give users the option to boot directly into the desktop, launch programs through an old-school Start menu, and maybe even bring back the Start button. This seems like the least likely option, given the steps Microsoft has taken to make its new interface unavoidable. I don't think Microsoft will cave unless there's a huge backlash. With Windows 8, Microsoft offers the possibility of one device that handles both desktop and tablet needs, without the need for remote desktop applications. Splitting up the OS would eliminate that advantage. This might be possible in the distant future, but right now Microsoft's strategy hinges on exposing everyone to the new user interface, so I wouldn't expect a split any time soon. Besides, businesses have taken a liking to the iPad, even as they continue to rely on desktop software. Microsoft is betting that buyers will like the fact that one device can do both without the need for remote desktop applications. Splitting up the OS would eliminate that advantage. The last possibility, and the one I think most likely, would be for Microsoft to continue to evolve Windows. The new interface would become more powerful and useful, while gradually chipping away at all the reasons you might need to revert to the desktop. Slowly, the benefits that the new interface provides—things like universal search, app-to-app sharing, and built-in cloud storage—would overshadow its drawbacks. Even if Windows 8 bombs, Microsoft won't give up. When Redmond wants in on an important market, it tends to keep throwing money and resources at it. We saw that with Bing, we saw it with Windows Phone, and we're going to see it again with Windows 8. Time will tell if Microsoft can be more successful with Windows 8 than those other efforts. Either way, it's highly unlikely that Microsoft will abandon its current vision and let this new wave of computing pass the company by. Desktop purists may not like the new look of Windows, but it's here to stay.